THERE AREN'T MANY theological issues that could unite the ultra-Orthodox group Agudath Israel, the Catholic Church, and the International Communion of Evangelical Churches, but gay marriage is one of them. Last month, as so many people in New York and around the country celebrated the State Senate’s vote to legalize gay marriage, it was easy to forget that this victory for civil rights appeared to these religious groups as a calamitous defeat. Traditionalist Jews, Catholics, and Protestants had all lobbied intensively against the marriage equality bill, and it received enough Republican support to pass only after religious organizations were exempted from having to perform or acknowledge gay marriages. In the unlikely event that Kleinbaum and that Hasid were to sit down with their Bibles and debate the Torah’s view of homosexuality, who would come away the winner? The answer seems totally unambiguous. Just look at Leviticus 20:13: “And if a man lie with mankind, as with womankind, both of them have committed abomination: they shall surely be put to death: their blood shall be upon them.” The law as written does not apply to women, but for homosexual men it means death. At this point, the twenty-first-century Jew—like the Protestant and the Catholic, anyone whose religion views the Bible as holy writ—has two simple choices, and one messy and unsatisfying one. The first simple choice is the one the Satmar Hasid would take: the Bible being God’s word, homosexuality is ipso facto an abomination, Q.E.D. The second is the one any secular rationalist would take: the Bible is not God’s word, and it has no more binding force than any other ancient Near Eastern law code. The Code of Hammurabi, for instance, holds that “If a man’s wife be surprised with another man, both shall be tied and thrown into the water,” but we are no more obligated to follow this law today than we are to follow Leviticus. Both reflect millennia-old views of gender and sexuality that now appear simply unjust. By this point, the game has been pretty well given away. 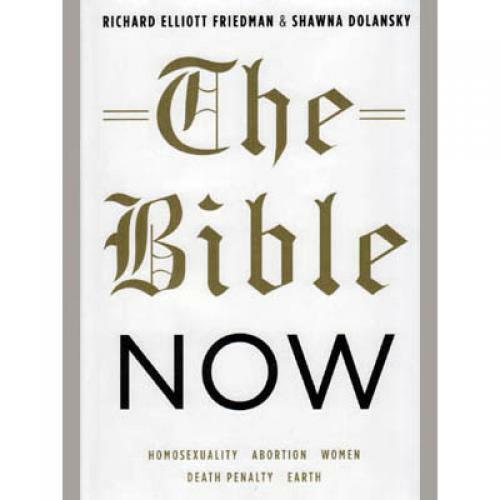 “We must use [the Bible] with integrity—and humility,” Friedman and Dolansky remark in their preface. “We have to recognize what it teaches even when that teaching goes against what we want. Better to reject the Bible’s teaching than to twist it to make it say what we prefer.” Yet their treatment of Leviticus is nothing but a masterful example of twisting the text to make it say what they prefer. What licenses this kind of reading is the principle that “God is free to change,” that is, to change his mind about what is offensive and inoffensive, good and evil—but only, it seems, in ways that bring him more in tune with the views of people like Friedman and Dolansky (and, I hasten to add, myself). So why, if I am basically in agreement with what I take to be Friedman and Dolansky’s views on all these questions, does The Bible Now make me so impatient? My reason is that, by paying so much attention to the way the Bible can be made to corroborate modern ethical beliefs, this book—like many similarly liberal and well-intentioned religious books—slights the actual sources of those beliefs. When it comes to the way we actually think about questions of right and wrong today, we owe more to Spinoza and Kant and Mill than we do to Leviticus—even though, it is fair to say, the West could never have produced those Enlightenment thinkers without its biblical inheritance. And the key principle of the Enlightenment is that we depend on our own autonomous reason, not on the authority of ancient texts, to decide what is just and unjust. We owe it to ourselves—especially in a country where the Bible enjoys so much moral and political authority—to declare openly that our moral reasoning is our own, that we do not have to reconcile our judgments with Leviticus in order to validate them. There is still something exhilarating in Kant’s answer to the question “What Is Enlightenment?”: “Enlightenment is man’s emergence from his self-imposed immaturity. Immaturity is the inability to use one’s understanding without guidance from another. This immaturity is self-imposed when its cause lies not in lack of understanding, but in lack of resolve and courage to use it without guidance from another. Sapere Aude! ‘Have courage to use your own understanding!’—that is the motto of enlightenment.” It is not the motto of traditional religions and their ancient sources.